Bruce has left the building nearly 3 years ago and he was of course totally essential in The Weathermen so when the idea to release the live backing instrumental tracks (used when playing shows) emerged it made me at first unconfortable to tell you the truth. Felt like a part was missing, the voice, of course, and also I was very unsure it was worth a release. Still, I played them to some friends, and to some-less friends, asking everyone for their honest opinion on: do these tracks stand by themselves ? Is it OK to release them without vocals ? And the overwhelming response was: yes, they are. And why? Because these backing tracks already integrate everything Weathermen: inventivity, boldness, challenging, no-care-for-norms, a strange mix of crossover (not really industrial, not really pop, what is that sh*t ?) and…FUN. And they sound reaaaal good with the new mastering. So, here you have them, going from the first European tour (1987) to our very last gig, in 2009. With The Weathermen, the writing process was very simple: I would compose, in studio and usually the music was done in a few hours or a day, never more. We would then discuss the vocals ideas and the lyrics and Bruce would throw all that on paper and sing on the precise instrumental the following day. To give you an idea, Poison was made in 2 days, mixing included (with the extremely indispensable input of Ludo Camberlin). 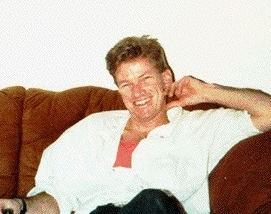 Very few things would be changed afterwards the basic music track was done and proposed to Bruce, except enhancing some details in the mix but, globally what one can hear in this instrumentals is very much what was on the tape before we added vocals and mix it all. Globally, we did 3 tours: the first one was in 1987 and I was pushed into it (I hate playing live) by Kenny Gates from Play It Again Sam as Poison was getting really big. The tour was very successfull and saw us in Holland, Denmark, Germany, Spain, France, Spain, Belgium and Switzerland. Most of the times the crowd didn’t know what to make of us: the industrial crowd often didn’t get the colors and the let’s-have-fun-attitude while the people drawn in by the success of Poison didn’t know what to make of harder and stranger songs like Mud or Barbie & Ken. Plus the small movies (all made by Bruce) were great to look at (at the time it was not as common as now to have a band using films). But, generally, people liked us a we were original and odd-balls and it was fun. We did another European tour in 1988 and then, early 1989, we had a 25.000 miles tour of the USA/Canada in the middle of winter. No one told us it was going to be THAT hard: it’s when you travel thru blizzards to make it to then next gig that you wonder if this whole circus is really worth putting your life and your health on the line. The Weathermen did some dates in 1989, without me tho as I was too busy having a nervous breakdown and Bruce went out touring with someone else on synths. Then, The Weathermen stopped playing live after 1990, until 2005 when we played some dates in Belgium and Switzerland. You can listen to a full 2006 concert on CD2. We have a video of a 1988 concert that was shot by german TV but the sound quality is not good. The tracks you’ll hear on the CD are coming straight from the original masters, only remastered. You can still hear the hiss here and there and some tracks have nearly never been heard until today: “Hot Rod Heaven” or the 2009 version of Poison are good examples. Then, in 2009, we decided to give the tracks a completely different feel and you can hear the “classic tracks” are being re-made and re-model to a much, much harder, much more challenging and in-yer-face tone. 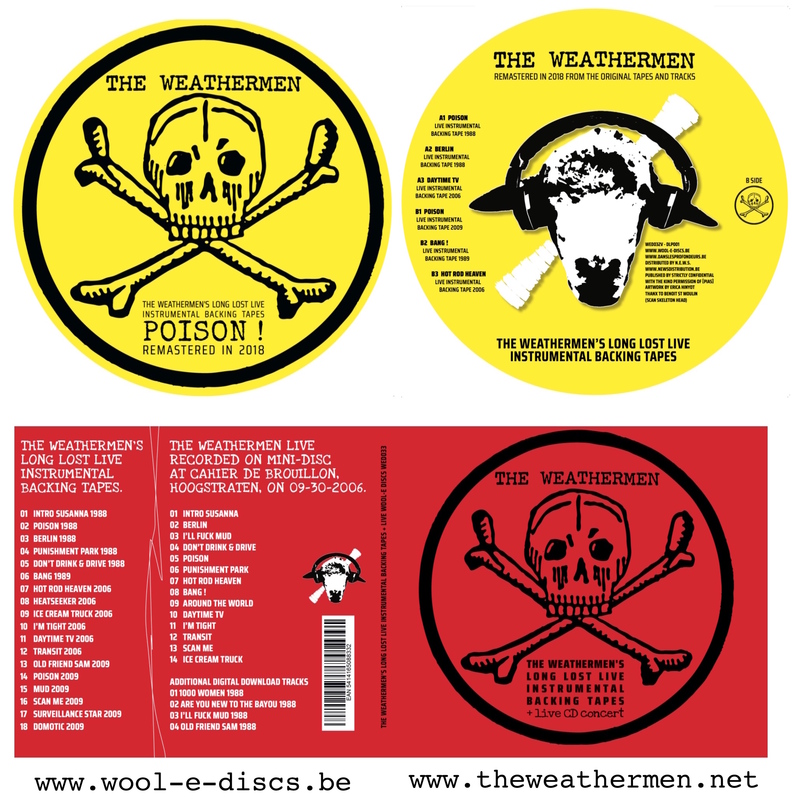 The last gig The Weathermen played was in 2009 in a pop-up club in Antwerp, the Kissinger. The PA was in mono and there was only one spot, a bright white light that was too narrow to light up the whole stage so it was really like playing in the dark, with the amazing videos from Bruce as background. And I think it was our best concert ever: The Weathermen at their truest, most artistic/politic/social comment. I hope you’ll enjoy the picture-disc and the 2 CDs as I believe they’ll give people a pretty good idea of what The Weathermen were about, with or without vocals.